Glorious Views And Elegant Comfort In One Of North Wales's Best Kept Secrets. Recently Renovated Two Bedroom Victorian Town-house, Overlooking Conwy Castle. 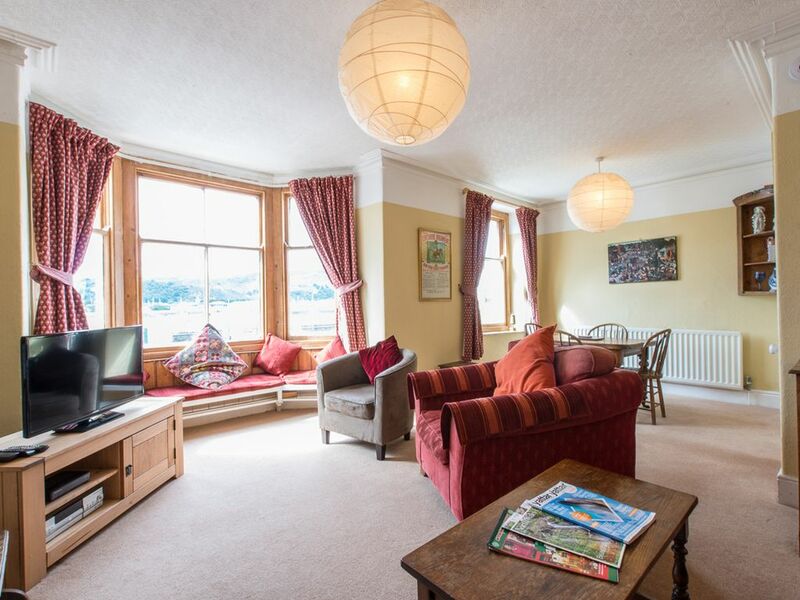 Two bedrooms (1 twin, 1 double en suite), one bathroom, spacious lounge and dining area with sensational views across the river Conwy and over to Snowdonia. One large kitchen and a terrace area for alfresco relaxation. Our popular, French bistro is located beneath. A secluded beach is 5 minutes walk away. Ours is a relaxing base from which to explore some truly breathtaking and memorable sights, including the dazzling Bodnant Gardens, the Victorian promenades of Llandudno, the rustic walks and rivers of Betws y Coed, Snowdon and some of the finest hill-walking in the UK, and the newly opened, already world-famous Surf Snowdonia up the Conwy valley. Bob and Barbara Ross at your service. We moved to Deganwy in 1988 to open a French country-style restaurant, which we ran here for over 15 years - Barbara being quite the Francophile and a natural in the kitchen. All the while we lived above the restaurant with our two children. Before that, we had been running a successful country pub near Corwen, having spent the previous decade farming in the hills above Ruthin. During that time, I played double-bass with the Merseysippi Jazz Band, which led to me jetting off regularly to America to perform in jazz festivals, with Barbara as my chief groupie. Since "retiring" in 2003, we have lived in the Languedoc in south-west France, in a succession of self-renovated cottages. It is an ideal location to indulge one of our other great passions: wine. Whenever we find a new and exciting wine, we ship it back over to the restaurant to sell exclusively. We fell in love with Deganwy as soon as we spotted it. We were keen sailors with a boat restoration project in the offing. As such, Deganwy was ideally located for us on the river Conwy, an extremely popular area for skippers from all over the world. We also found that, having lived a rural existence for so long, Deganwy was a remarkably central location. It is less than an hour's driving distance from Liverpool, Chester, Portmeirion, Snowdonia and Beaumaris. We recently used our renovation skills to transform this waterfront-set family home into an extremely comfortable holiday flat for others to enjoy. Like many properties from the same period, the rooms are very spacious. The décor is unobtrusive and designed to help you relax. The moment we both looked at each other and instantly decided to buy this place was when we first gazed through the living room window at the boat-filled river, over to Conwy castle with the mountain range of Snowdonia set clearly in the distance. We felt privileged to have had such a view on our doorstep for so long. The main bathroom features bath, shower, sink and WC. Towels provided. There is a utility room for the cleaner just off the kitchen, with a washing machine that you are welcome to use. Electric, situated in the living room. Comfortably fits four people in a relaxed posture. An under-counter refrigerator with freezer compartment. Tea, coffee and dry goods provided, along with a welcome pack of cereals, fresh fruit and wine. The kitchen was installed in 2016 and has everything you'll need to cook up fabulous meals for your crew. The dining area is situated to the right of the living room area. Several DVD titles on the shelf in all genres. The flat is accessed via a staircase up to the back terrace which features a table, chairs and parasol, for the summer days when it becomes a sun trap. The flat is accessed from an outside staircase, and the stairs inside are a little bit steep. As such, we cannot in all good conscience claim that it is suitable for guests with mobility difficulties. Just had a brilliant few days in North Wales complemented by the accommodation we stayed in. This 2 storey maisonette was very spacious, had everything needed for a short self catering break and had some nice personal touches like a bottle of red wine on arrival and sweets for the kids. The only downside is the fact you have to go up a fairly tight staircased entrance and it has no private parking, although you can park in the car park opposite with the pass provided. It is also quite cold accomodation, even with the heating on it's not the warmest although there is an electric fire which gets the downstairs warm enough. The view from the front is amazing though, you can see Conwy Castle and the whole place is very comfortable and relaxing. A lovely apartment overlooking the estuary to Conway which has everything you need for a relaxing holiday. We came to visit the annual Conway Food Festival and couldn't have been better situated. Having the fabulous Paysanne restaurant just downstairs added to our enjoyment. fantastic stay. relaxing and amazing. The flat was in a great location with fab views over the estuary and castle. It was well appointed with all we needed. The wine & fruit on arrival was a nice touch however a small supply of milk in the fridge would have been good as we arrived late and then had to go back out to find milk! We met Cai the owner and also dined in Paysanne which is definitely recommended. Well equipped, comfortable apartment with amazing views. Apartment with a lot of original features, doors and windows but comfortable bedrooms and excellent ensuite and second bathroom. Large well equipped kitchen. Excellent restaurants close by including of course Paysanne itself. Lovely apartment, great base for exploring the area. Friendly host. Also enjoyed a meal downstairs in the bistro. Brought our 2yr old, travel cot fits in the back bedroom when we moved a bed.